Ancient UFO Depiction Discovered in Romanian Monastery Painting? Intriguing new find for you ancient astronaut enthusiasts! 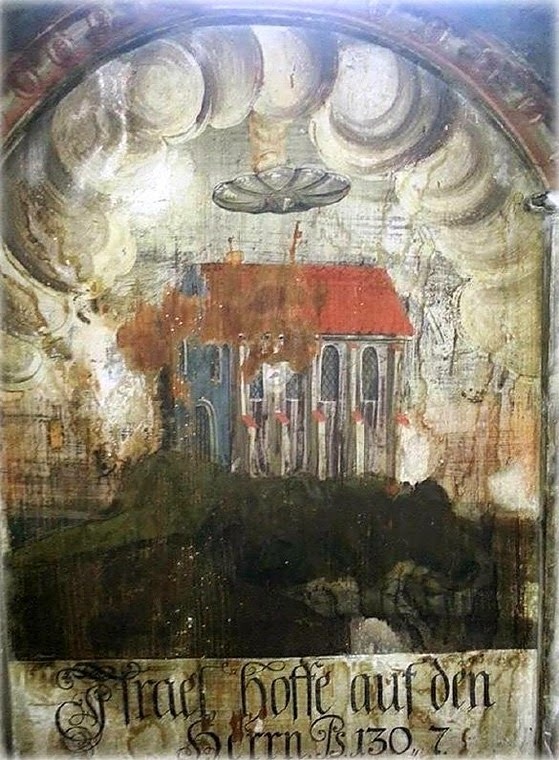 A picture of a painting in the Biserica Manastirii (Church of the Dominican Monastery), in Sighisoara, Romania, depicts a mysterious flying disc, poised above a building. According to Gilli Schechter and Hannan Sabat of the Israeli Extraterrestrials and UFOs Research Organization (EURA), they received a picture of the painting from Catalina Borta who took the photograph while visiting the monastery. EURA explains that this is a quote from Psalms song of ascents, c.130 v.7. The age of the painting is unknown, but monastery was originally built in the 14th century. It was later destroyed and rebuilt in the 17th century. The EURA says that the caption in the painting probably dates it to after 1523, when the bible was translated into German. It also appears to either be at the end of a fiery trail or to perhaps have a pillar of light emanating from the “top.” Looking at the image, it’s difficult to imagine what the painting could be depicting if not a spacecraft!